As more women enter the workforce the pressures and challenges they face only begin to increase each year. Despite these growing obstacles many women persevered and surmounted even the most difficult barrier and reached the upper echelons of industry. 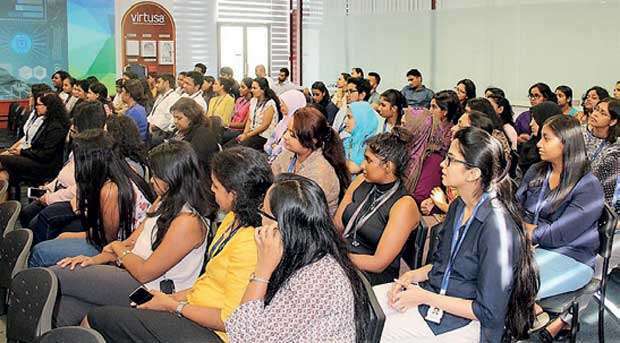 Virtusa recently sat down with some of these trailblazers at a panel discussion on ‘How to Achieve Career Nirvana’ to understand the secrets of their success and to impart some wisdom on many who were just starting out on their journey. The four panelists gathered at the moderated discussion hailed from diverse backgrounds and excelled in different fields, however, reached the pinnacle of their career facing similar challenges. The packed crowd, majority being women, in attendance were given a rare glimpse of the thought processes the panelists applied in overcoming these challenges and their unique point-of-view in understanding the problem before them. On the matter of a work life balance the panelist agreed that it can seem that, especially as a woman, they are being pulled from all directions. They have to fulfill their traditional role as wife and mother as well as work twice as hard as others to prove to their colleagues and superiors that they are committed to their careers. This can be a demanding task but it need not be a zero sum game. Standard Chartered Sri Lanka Corporate Affairs, Brand and Marketing Country Head Sanjeewani Ranashinghe de Silva began her career as a journalist during the civil conflict and had a stint in advertising before making the unlikely transition to the corporate world with a position at the Ceylon Tobacco Company (CTC). She believes that for women to achieve that ideal work life balance they need to first build a strong resilience. She credits this for her enormous confidence and taking her far in her career. “If women are to get anywhere in this world they will need the confidence that comes from being resilient. I am up here today because I had that. After my second child was born and the opportunity came to advance my career I had my doubts. And even worse, others fed those doubts - from all sides. But if you want to have it all then you have to prove those naysayers wrong and the only way to do that is prove it to yourself first,” she said. “People will question whatever you do so it’s important to not hide your head in the sand simply because things get a little tough. Answer those questions for yourself and be sure of what you want to do,” she added. Nation’s Trust Bank Director and Chief Executive Officer Renuka Fernando also believes that being certain of what you want for you and your family plays a major part in holding on to both your career and personal life. “It came to the point that I even considered giving up my career. But it is when times are toughest that it’s important to just be yourself. As long as you know, and are comfortable with your decision, that this is how you do your best for your family then you have to stay the course,” she said. “One day, you may not even realise it but your child will understand everything you did and appreciate you for it. And you will become their role model,” she added. The discussion then turned towards the matter of overcoming the challenges of the workplace which can be demoralising for anyone but women, who may be under greater scrutiny, can often let one error be their undoing. However, it need not be and can actually be a learning experience that strengthens their resolve. NDB Securities Chief Executive Officer Prasansani Mendis explains that the challenges you face change at each stage of your career and your ability to handle them and how well equipped you are to do so will differ. But it is important to keep a positive attitude, be committed to your goals and enjoy everything you do. “You will face many challenges early in life but it is important to view them as opportunities and tackle them head on. These are learning experiences that will shape you and your future. Later on in life there will be a completely different set of challenges, your focus may be split between family and work but it is important to be equally committed, work on being a multi-tasker, be clear in your communication, and have a positive attitude. There is no such thing as an insurmountable challenge. Everything is possible and that’s the mindset you need to have,” she said. Building on Prasansani’s point, University of Warwick, UK, Warwick Business School Associate Professor Dr. Dulini Fernando explained to the audience that one of the most important lessons she learned in her life was to not over analyse things and block out everyone’s voice except her own. “I feel that a lot of these things women face can sometimes be in our minds. People will always say things but it’s important for us to not take notice of it. Garbage in, garbage out. Because if we stop to think about everything people say to us it will take up all our time and may even make you feel victimised which will only hinder your ability to manage and be detrimental to your career. Remember that you can be your own worst enemy. Being aware of that can help you to get out of your own way,” she said. “It’s not an easy task but you can train your mind over time to achieve this until everything else is white noise,” she added. In the final moments of the discussion, echoing the thoughts of her fellow panelists and touching upon the underlying theme of everything discussed, Renuka Fernando explained that women need to be comfortable in what they want to be and it should be for them, their family and their employer. Nothing else matters. “We have to admit to ourselves that we are only human. Society usually places heavy demands on us to be super career women, super daughters, super wives, super daughter-in-laws, and super mothers. But we have to realise that we are not super everything all the time. Depending on the situation, we may be super career women or super mothers but we cannot be all things to all people all the time. You need to be confident that what you are doing is right for you, your family and your employer. This alone can be a huge challenge for women in Sri Lankan society but we can overcome it,” she said.